I’ve used this BB cream for more than a year now and I love it! It is a little bit lighter and more yellowish then my skin tone. But I use it with a small amount of product. 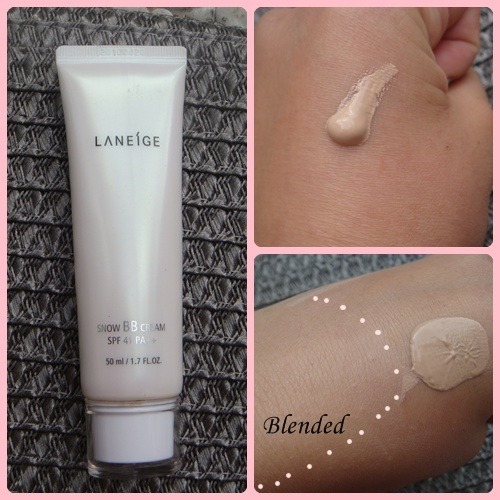 I use this BB cream daily only on my T-Zone, which where all the blemishes are. And I blend it out to my cheeks. The BB cream settles and blends into my skin very well. Because of the watery and light-weight texture it blends easily into my skin. It doesn’t feel heavy at all! It has also a nice cream scent. The coverage would be light to medium. The BB cream does covers slight my blemishes and would still look very natural with one layer. It leaves the skin with a dewy finish. And a plus is the SPF 41 PA++! The BB cream also leaves my skin very soft and moist.